Batting Against Breast CancerTM is a family friendly, community-led slo-pitch tournament in support of the Canadian Cancer Society. Taking place in three locations during the summer of 2018, this annual event is a way to take a swing at breast cancer while building awareness and fundraising for the cause. Teams comprising a minimum of 10 people and a maximum of 15 (At least three members MUST be female) are able to register online and start fundraising right away. This event is also a fundraising challenge, so each team is required to raise the minimum fundraising amount for their respective location in order to participate. Fundraising minimums vary per location. Prizing is awarded to top team and individual fundraisers. New to slo-pitch? Not to worry. 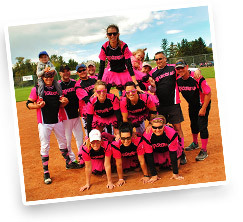 Batting Against Breast Cancer has a variety of divisions, making it fun for all skill levels. Divisions vary per location. Beyond a fun day full of slo-pitch, each location also runs various events, such as marshmallow golf, homerun competitions and other family-friendly activities, throughout the tournament.